FIMCO Products – FIMCO Manufacturing Inc. The FIMCO Hydro-Indexing Valve is the modern, no worry way to ensure smooth working, dependable service for all sprinkler, wastewater and aquaponics systems. The Hydro-Indexing Valve is activated by sufficient water supply being turned on and off, therefore, no electrical wiring is required to the valve. All that is needed for a totally automatic system is a controller to turn on and off the water supply (pump or solenoid). The Hydro-Indexing Valve operates under most all water conditions and is available in three styles to enable the valve to index properly under normal, low, or high water conditions. FIMCO Hydro Indexing Valves are preassembled with a sequencing cam depending on how many zones are on a particular sprinkler system. The cam can be easily removed and replaced by a different cam if sections are added or eliminated. 1000 Series: 1” valve in 2 through 8 zone models. 2000 Series: 1 1/4″ mini valve in 2 through 6 zone models. 3000 Series: 1 1/4″ standard valve in 2 through 6 zone models. 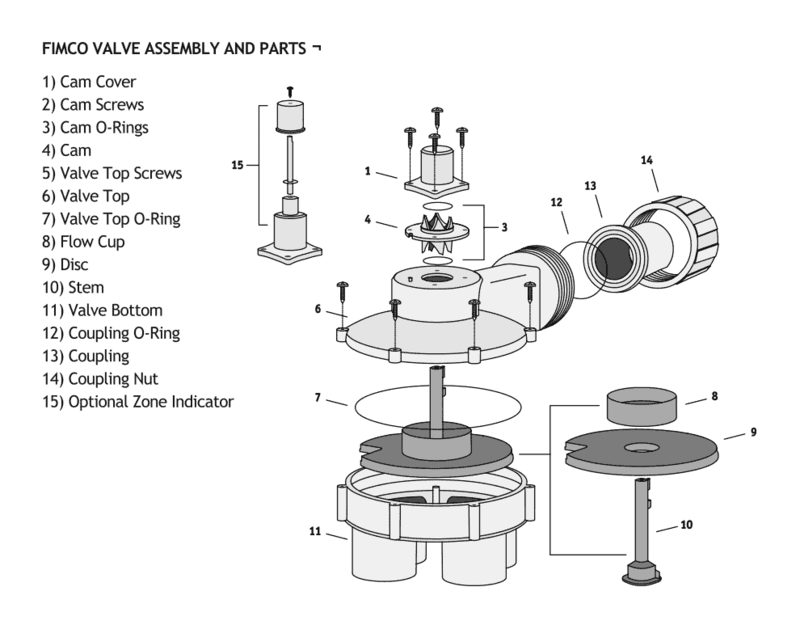 4000 Series: 1 1/2″ valve in 2 through 6 zone models. 5000 Series: 1 1/4″ metal top valve in 2 through 6 zone models. 5000F Series: 1 1/4″ fiberfill top valve in 2 through 6 zone models. 6000 Series: 1 1/2″ metal top valve in 2 through 6 zone models. 6000F Series: 1 1/2″ fiberfill top valve in 2 through 6 zone models. 1000F Series: 1” valve in 2 through 8 zone models with Zone Indicator. 2000F Series: 1 1/4″ mini valve in 2 through 6 zone models with Zone Indicator. 4000F Series: 1 1/2″ valve in 2 through 6 zone models with Zone Indicator. Snap-on Saddles are an easy way to add sprinklers to a new or existing irrigation system with no need to cut pipes and add T fittings. Simply apply PVC cement to the pipe and the saddle, then snap the saddle onto the pipe and drill a 1/4″ hole through the 1/2″ female threaded fitting and into the pipe. Snap-on Saddles are manufactured to fit 1/2″, 3/4″, 1″, 1 1/4″ and 1 1/2″ pipe. They can be used to add sprinkler heads, drip lines, adapters for more 1/2″ pipe and whatever else you may need that fits into a 1/2″ threaded female fitting. FIMCO’s remote Pump Start Relay is for use with controllers which do not have internal pump circuits.